Why Visit Devon this Christmas? | Blog | The Devon SEO Co.
Why Visit Devon this Christmas? While many people might think of Devon as a destination to spend their summer holidays, it’s actually got tons of all-year-round appeal. In fact, if you’re looking for somewhere to get into the Christmas spirit, Devon is the place to be! Here are some of the many activities you can get involved with in Devon this December. There’s nothing like visiting a Christmas market to embrace the spirit of the festive season. As well as sampling seasonal goodies, such as mulled wine and mince pies, Christmas markets are a great place to stock up on interesting and unusual presents for the whole family. Head to the foot of the cathedral in Exeter for the city’s Christmas market, complete with stalls and carol singers, or seek out glassware and candles at the Christmas market in Lifton. Shoppers will be enthralled by the 50+ stalls on display at Plymouth’s Christmas market. These are just a sample of the many festive markets taking place in Devon during December. Father Christmas will be doing the rounds in Devon this December, so keep your eyes open for him on various days and in different locations. For instance, Woolly’s Winter Wonderland in Bideford is a top family attraction, where you can meet Santa and capture the magic of the enchanted forest. Alternatively, head over to the South Devon Railway in Buckfastleigh for the ever-popular Santa by Steam train rides. Visitors to Dartmouth Steam Railway should not miss the famous Santa Express and Train of Lights. 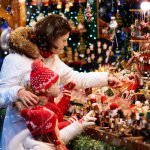 Little ones will also be happy to discover that Father Christmas will be putting in an appearance at the Candlelit Dartmouth festive weekend and Kingsbridge farmers market. Devon is stunning at any time of the year, but with the summer crowds having long since departed, you get more of the place to yourself in December. If you fancy a break from the endless shopping and festivities, why not explore this picture-perfect countyside? Dramatic scenery awaits you with a visit to Dartmoor (there might even be snow! ), while the coastal towns of Sidmouth and Dawlish ooze atmosphere and charm as winter beckons. Devon is the ideal county to visit if you fancy stretching your legs, offering easy to challenging walks for all the family. With the South West Coast Path hugging this region, you can dip in and out of the path as you choose. In particular, if you’ve got a half hour to spare, head to Woolacombe Warren and follow the path that leads to the beautiful beach. For those wanting to go that bit further, the four-mile walk from Meadfoot to London Bridge provides jaw-dropping views of Tor Bay and the Millennium Bridge. Devon is famous for its foodie scene, and since December is the month to eat, drink and be merry, it’s the perfect county to make a beeline for. You’ll be spoilt for places to try (many boast a Michelin Star or two). As well as enjoying the culinary delights at the region’s Christmas markets, consider dining out at famed eateries, The Masons Arms in Knowstone, Gidleigh Park, The Riverfood Field Kitchen, The Oyster Shack and The Elephant. Expect to find special Christmas menus, serving traditional dishes as well as local specialities. Devon has certainly got a lot to offer this Christmas, and at other times of the year. If you’re also looking for a Devon based SEO company that has got plenty to offer, you’re in luck with The Devon SEO Co. As well as offering web design and development, you get SEO and social media management from highly experienced professionals. The Devon SEO Co. team would like to wish you all a very Merry Christmas and a Happy New Year!